Okay, so this is not a pilot, but I have to gush about this most recent episode of Community, “Comparative Religion.” If you are new to the show, this would be a great episode to start with because, in fact, it has all the elements of a pilot. Each member of the ensemble cast is featured more or less equally, and we get to learn what each one is like. And it’s set on a day that will be a turning point for all of them—passing Spanish 101. It’s the last day of classes at a Greendale Community College before the winter break; we know all of this from a brief announcement by the bumbling Dean. This is much the same as the opening scene of the pilot. Through his portrayal of “Mr. Winter,” a religion-neutral holiday character, we get the message about the school’s obsessive PCism. The scene really captures the insanity of this show. 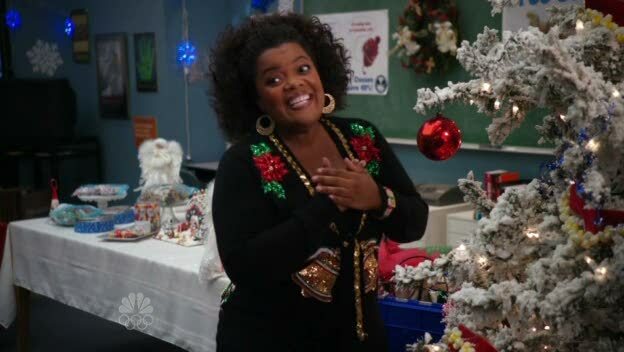 The episode revolves around a holiday party, being planned by Shirley (Yvette Nicole Brown), a recently divorced, middle-aged student who professes her strong adherence to the true (i.e. Christian) meaning of the holiday season. By each character explaining his or her beliefs or lack thereof, we get a well-rounded and hilarious picture of this ragtag group of Spanish students. There’s the Jehovah’s Witness, the Atheist, the Agnostic, the Muslim, the Jew—ahem, the Jewish woman — and the claims-to-be-Buddhist-but-is-apparently-just-in-a-cult guy. I’m disappointed that there’s no Pagan, but it’s a fun mix anyway. It’s the perfect set-up for grossly offensive humor. And it works because, for all their differences, these people are all friends, who operate more like a dysfunctional family. The show also has a running gag of parodying 80s movies. When Jeff (Joel McHale) is challenged to a fight a tough guy in the cafeteria, we’re reminded of any number of films where the main character is challenged to a schoolyard brawl, and his friends are by his side to help him prepare. The group is divided over Jeff’s choice to fight; Shirley thinks it violates the Christmas spirit (even though it’s only December 10), and Britta thinks it represents repressed homosexuality. These are typical responses by both of these characters that have been reinforced throughout the fall season. Of course it all has a hooray-Christmas-is-saved ending, but with a hilarious twist that further emphasizes the characters’ kinship and the show’s irreverence. Lessons are learned, but the characters remain as crazy as ever. I was a little skeptical about this show’s promise when it debuted in September. But it has turned out to be consistently entertaining and out-of-the-box, culminating in a fantastic fall finale. You have to buy into the premise that these seven people would hang out together in the first place, but if you can do that, it’s totally worth it. I just have one question… what ever happend to John Oliver’s character? For added laughs, check out the Greendale website. This entry was posted in 2000s, Comedies and tagged christmas episode, community, fall finale, greendale, Joel McHale, Yvette Nicole Brown by meekthegeek. Bookmark the permalink.